Conceptually, smoothies (and smoothie bowls) are simple enough to make – ingredients, blender, that’s it. Nutritionally, however, many people get it wrong quite often. If you want a smoothie to sustain you, help control blood sugar and fuel your day then it’s important your smoothie is nutritionally balanced. Here I teach you the key principles of making a nutritionally balanced smoothie. Does it contain a source of protein? Does it contain a source of low-sugar, slow digesting carbohydrate and fibre? Does it contain a source of healthy fat? Where possible, are these sources real foods? Protein, healthy fats and fibre are digested slower than sugars and simple carbohydrates so they will be satiating, help you feel fuller for longer and help with blood sugar regulation after consumption of the smoothie. Nutrients from real foods are also more easily recognised by the body and assimilated after consumption. By ensuring your shake contains real food sources of protein, slow-digesting carbohydrate, fibre and healthy fat you will avoid blood sugar spikes and drops throughout the day/afternoon. From there it’s a matter of jazzing up your smoothie with different ingredients and other flavours to make it delicious! I usually like to use about 1/3-1/2 cup fruit for to help with sweetness then add about a cup of steamed and frozen cauliflower or zucchini for low sugar carbohydrates. I usually use water and some ice to bring my smoothies together and occasionally some nut milk, depending if I want it to add flavour to the smoothie. Pumpkin Pie – roast pumpkin, cinnamon, nutmeg, 2 T Inca Inchi Protein Powder OR 180 Nutrition Vegan Superfood, avocado or coconut yoghurt and some coconut milk, sea salt. Choc-Peanut Butter – 1/2 cup banana, 1/2-1 cup frozen cauliflower, 1 T peanut butter, 1 t Grilo Protein, 180 Nutrition Hemp Plus , 1/4 of an avocado, sea salt. Turmeric Latte – 1/2 cup banana, 1/2-1 cup frozen cauliflower, 1-2 t of your favourite turmeric latte spice mix, 2 T Inca Inchi Protein Powder OR 180 Nutrition Vegan Superfood, coconut yoghurt or cream. Coconut Mango – 1/2 cup mango, 1/2-1 cup frozen cauliflower, 2T Inca Inchi Protein Powder OR 180 Nutrition Vegan Superfood, 2 T shredded coconut, coconut cream or coconut yoghurt. Mixed Berry – 1/2 cup berries, 1/2-1 cup frozen cauliflower, 2T Inca Inchi Protein Powder OR 180 Nutrition Vegan Superfood, 2 T shredded coconut, avocado or coconut yoghurt. Piña Colada – 1/2 cup frozen pineapple, 1/2-1 cup frozen cauliflower, 2T Inca Inchi Protein Powder OR 180 Nutrition Vegan Superfood, 2 T shredded coconut, coconut cream or coconut yoghurt. I usually use water and some ice to bring my smoothies together and occasionally some nut milk, depending if I want it to add flavour to the smoothie. 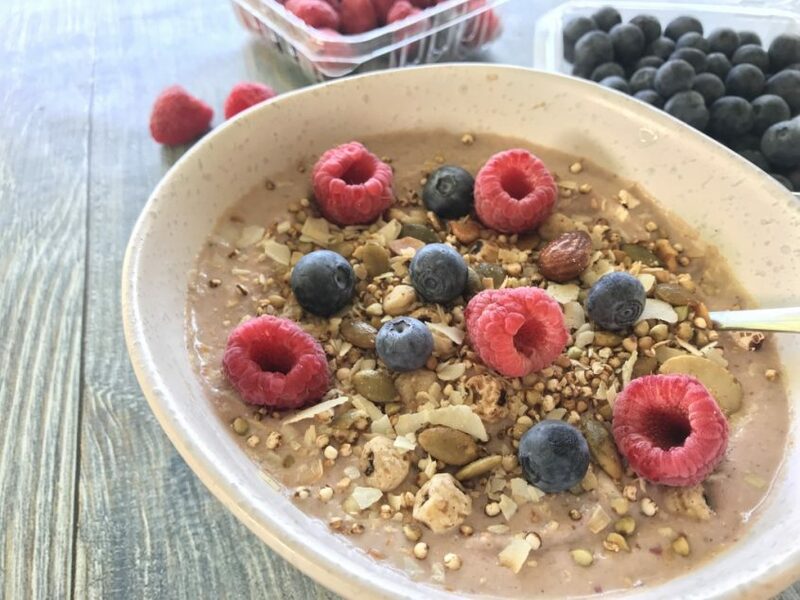 I also love to ‘eat’ my smoothies from a bowl with some crunchy toppings so I tend to make mine a bit thicker than others might like… each to their own! I hope this has been useful for you! Please comment below if you have any questions!